This guest column is by Bloomington resident, substitute teacher and former MCCSC employee David Wierhake. In February, I appeared before the MCCSC School Board to discuss compensation levels for substitute teachers. I explained that the day rate for substitute teachers has remained flat for the past decade, while there have been incremental annual pay increases for both staff and teachers alike. I also referred to the national average pay rate for sub teachers to be approximately $105/day. (Source: National Substitute Teachers Alliance). Everyone seemed surprised saying, “That’s interesting. No one has brought this issue to our attention before.” One board member suggested that someone take on this issue as a “graduate thesis,” intimating that said issue might be outside the interest of the school board. Such an issue deserves more than some pet educational exercise; it is a real life issue involving real people who not only depend on sub teaching income to survive, but who thrive and excel within our educational system. As the new MCCSC budget(s) come under discussion, I strongly urge our school board to find it within their hearts to work whatever financial magic they can and increase the day rate for sub teachers to compensate this talented yet silent pool of fill-in teachers who keep our schools running successfully. In other school systems throughout the U.S., substitute teachers are treated with dignity and respect as the professional educators they are, and receive compensation commensurate to the essential services they perform. MCCSC Substitute Teachers TAKE ACTION NOW! "An hour's pay for an hour's work!" Unhappy with working an extra hour during the new extended school day with no adjustment to the $60/$70 day scale*? Contact the MCCSC School Board and Superintendent Judy DeMuth to express your displeasure and urge them to use their upcoming WORK SESSION to find a way to increase the pay rate to $70/$80. MCCSC Substitute Teachers: ‘Support Staff’ or Not? Thank your allowing me to speak out on the issue of substitute teachers compensation. I look forward to revisiting this issue on September 27th when the public is invited to make comments regarding the MCCSC budget(s). Support folks? The school system could NOT function without the ‘support folks’ known as substitute teachers. (This statement is supported publicly by both Peggy Chambers and Judy DeMuth and no doubt countless teachers and aides. My hat is off to sub coordinator Patti Sparks for her dedication and savvy in keeping the schools functioning!) I am sincerely inviting the School Board and Corporation to spread the ‘concern’ and include substitute teachers in the corporation’s financial decisions! (On June 23rd Mr. Muehling communicated to me that “Mrs. Chambers is currently reviewing this (sub pay rate) and other support staff issues and will be making a report to the board in the near future.” So in reality Mr. Muehling did at one time consider sub teachers to be a part of ‘support staff’. And what was the content of the report to the Board regarding adjusting the pay rate for sub teachers? Nothing of any substance regarding this issue came to light at last night’s meeting. Are we, the public, to assume that such discussions never see the light of day as they are contained within the Board’s work session? I look forward to addressing this observation at the September board meeting. Thank you again for hearing my voice. MCCSC Comptroller Tim Thrasher said this year’s general fund budget is just more than $65 million, a 1% increase over 2010. He said the corporation’s 2010 referendum brings in a little more than the corporation currently uses, but not so much that there’s disposable income or a need to ask for a lower tax rate. “The referendum budget doesn’t use quite all of the $7.5 million that’s generated,” he said. “There’s still a fair amount of uncertainty about where we’ll be going in future years in terms of state support. So in terms of the recommendation in 2012, we will request the full 14.02 cent tax rate.Thrasher said raises are expensive, adding the corporation values substitute teachers, but right now doesn’t have the budget to pay them more. My name is David Wierhake. I am an actor, musician, and songwriter, and I’m a veteran substitute teacher ‘employed’ by MCCSC. I am here to speak out on behalf of all substitute teachers within this school system. Many of you may recall that I appeared before the Board in February of this year. The topic of my discussion was that the day rate for substitute teachers has remained flat for the past decade while there have been incremental annual pay increases for both staff and teachers alike. I also referred to the national average pay rate for sub teachers to be approximately $105 for a full day according to the National Substitute Teachers Alliance. (For the record I would like to include the Substitute Teacher Bill of Rights from the NSTA as part of my statement.) The Board seemed mildly surprised saying that, “That’s interesting. No one has brought this issue to our attention before.” With all due respect to the Board member who suggested someone take on this issue as a “graduate student thesis” or the like, intimating that it might be outside the interest of the MCCSC School Board, I would say that this issue is not some pet educational exercise, but a real life issue involving people like me, who not only depend on supplemental income from sub teaching, but who thrive within the educational system. Upon learning that the new school year would be extending the teaching day in elementary, middle, and high schools by approximately one hour, I contact School Board President Jim Muehling via email regarding pay adjustment for sub teachers to compensate us for the additional hour of our time. Everyone is in agreement—from Peggy Chambers to our new superintendent Judy DeMuth—that the school system could not function without sub teachers, and, quoting Superintendent DeMuth from an HT Online Chat in response to my sub teachers pay rate query, “Our substitute teachers have a most difficult job and are extremely important to us.” Mr. Muehling and I—and I’m including copies of our email discussions for the record, and, everyone on the Board received electronic copies of our discourse—engaged in thoughtful discussion concerning a pay increase for subs. From my perspective, IF you extend our working day by an hour, based on our past pay rate of $60/day non-certified and $70/day certified, an additional $10 would be added to said day rates e.g. $70 and $80 respectively. Mr. Muehling considered such a pay increase to be out of the question and made a ‘apples and oranges’ comparison between sub teachers and licensed/union teachers—who receive healthcare and retirement benefits and paid summers off—saying that teachers only got a 1% pay raise. From Mr. Muehling’s perspective it’s, “…in a university community we are in a position to secure an educated and talented substitute pool which plays some role in the law of supply and demand.” rather than the ‘law’ of fairness and morality. Such a response in my mind is totally unbecoming of an elected official, an official who supposedly leads MCCSC. I hope that at the end of my remarks, Mr. Muehling can somehow shed some light on his comments. According to Patti Sparks, substitute teacher coordinator, and our new superintendent, the pay rate for sub teachers will remain the same, or in other words, sub teachers will be getting a dock in pay. As this new budget or budgets come under discussion, I strongly urge the Board to find it within their hearts to work whatever financial magic they can and increase the day rate for sub teachers to compensate this talented yet silent pool of teachers who keep our schools running. p.s. 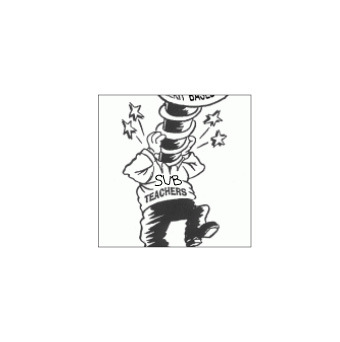 Here is the coverage from WFIU radio regarding the substitute teacher ‘pay cut’ and according to School Board President, “Our first concern are the folks that are on staff now, our certified personnel as well as our support folks.” Support folks? The school system could NOT function without the ‘support folks’ e.g. substitute teachers. Spread the concern and include substitute teachers in the corporation’s financial decisions! Though next year’s Monroe County Community School Corporation budget is greater than last year’s, some part-time personnel are concerned because newly-extended school days don’t equate to more dollars. During a meeting Tuesday, MCCSC substitute teacher David Wierhake urged the budget committee to increase substitute teachers’ pay. He said after being with the corporation for a decade, his pay has remained flat. He says an additional hour of work each day should equal more cash. School board president Jim Muehling said decreased funding from the state means it’s difficult enough to find funding for full time staff, so part-time employees will have to wait. MCCSC Comptroller Tim Thrasher said this year’s general fund budget is just more than $65 million, a 1% increase over 2010. He said the corporation’s 2010 referendum brings in a little more than the corporation currently uses, but not so much that there’s disposable income or a need to ask for a lower tax rate. “The referendum budget doesn’t use quite all of the $7.5 million that’s generated,” he said. “There’s still a fair amount of uncertainty about where we’ll be going in future years in terms of state support. So in terms of the recommendation in 2012, we will request the full 14.02 cent tax rate. Thrasher said raises are expensive, adding the corporation values substitute teachers, but right now doesn’t have the budget to pay them more. Shameka Neely, a native of Nashville, Tennessee enthusiastically joined WTIU as Senior Reporter/ InFocus Producer in the news department. Shameka previously worked at Western Kentucky University located in Bowling Green, Kentucky, as Coordinator for Minority Student Recruitment. In past years she has also, hosted a Public Affairs show entitled New Horizons at the ABC affiliate in Bowling Green. She holds a Bachelor of Arts in Organizational and Corporate Communication, with a minor in Marketing and Masters of Arts Degrees’ in Administrative Dynamics and Communication all from Western Kentucky University. She is also a proud member of Gamma Beta Phi, and Delta Sigma Theta Sorority Inc.